MLS outfit hope recently-released Nigeria international can get the best out of Thierry Henry. New York Red Bulls are lining up a shock move to sign long-serving Newcastle United forward Shola Ameobi, CaughtOffside understands. The 32-year-old, who made two substitute appearances for Nigeria at the 2014 FIFA World Cup, is currently a free agent after being released by Newcastle in May. 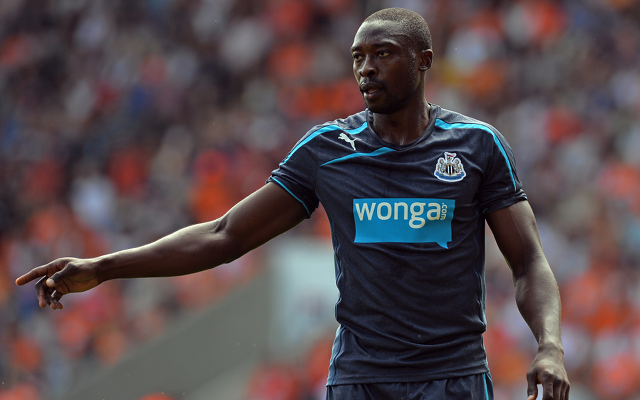 Ameobi has spent his entire career at St James’ Park, apart from a six-week loan spell at Stoke City in 2008. He made 397 first-team appearances for the Magpies, scoring 79 goals, including seven against arch rivals Sunderland. As his record shows, Ameobi is not the most prolific frontman. However, his experience and physical prowess could help him excel in the USA. Red Bulls head of global football Gerard Houllier is currently on the lookout for a third Designated Player to join Arsenal legend Thierry Henry and ex Everton midfielder Tim Cahill in Harrison, New Jersey. Ameobi is high on Houllier’s wish-list and the former Liverpool manager wants him to move to Red Bull Arena to form part of a three-man attack, alongside Henry and Bradley Wright-Phillips, who is the leading scorer in this season’s MLS. Sydney FC are also interested in the possibility of signing Ameobi, but he is just one of six international strikers that the Australian side are looking at. Red Bulls are hopeful of wrapping up a deal for Ameobi within the next two weeks and they also want to extend Henry’s current contract, which is due to expire at the end of the year. Henry has scored 45 goals in 114 MLS appearances since joining the Red Bulls from Barcelona in 2010. Despite being just over a month away from his 37th birthday, Red Bulls bosses are keen to get one more full season out of the Frenchman. Houllier and coach Mike Petke are confident that Ameobi could get the best out of Henry by creating space for the 1998 World Cup winner in key attacking areas. Ameobi partnered Alan Shearer, Patrick Kluivert, Craig Bellamy, Michael Owen and Loic Remy during his Newcastle career.